Happy Thursday, friends! I found so many Target favorites that I’m excited to share! I tried this corduroy skirt on at Target recently, and I HAD to get it! It fits so well and looks so cute paired with a warmer top or sweater! Just make sure to go down 1 or even 2 sizes, because it runs big! You will see that mentioned in the review it has gotten so far, as well. I would normally probably get a size 2, and I got the size 0. The chenille sweater I paired with it is SO soft and cozy! I got an XS, and it fits perfectly! I have also been trying to find some boots that I love and want to share with you guys, but I haven’t been really impressed with any I have seen so far. So I will keep an eye out! I did link a pair below, though, that have gotten great reviews! Otherwise, I will keep sharing some great slip-on sneakers to wear as we transition into the colder weather! You guys see me wear the grey ones above A LOT. They aren’t from Target, but they are such a great investment! I got them last year, and they are worth every penny! I went up half a size. The leopard sneakers are from Target, though, and I love them too! I recommend going up 1 full size! I normally wear a size 8 and got a size 9! Target is coming out with so much good stuff right now, so I am excited to keep seeing all of the new, cozy Fall/Winter items continue to fill the stores! 🙂 You can also always easily shop my daily outfits coming up by going to my blog’s shop page! Have fun shopping my Target favorites, and have a great weekend! 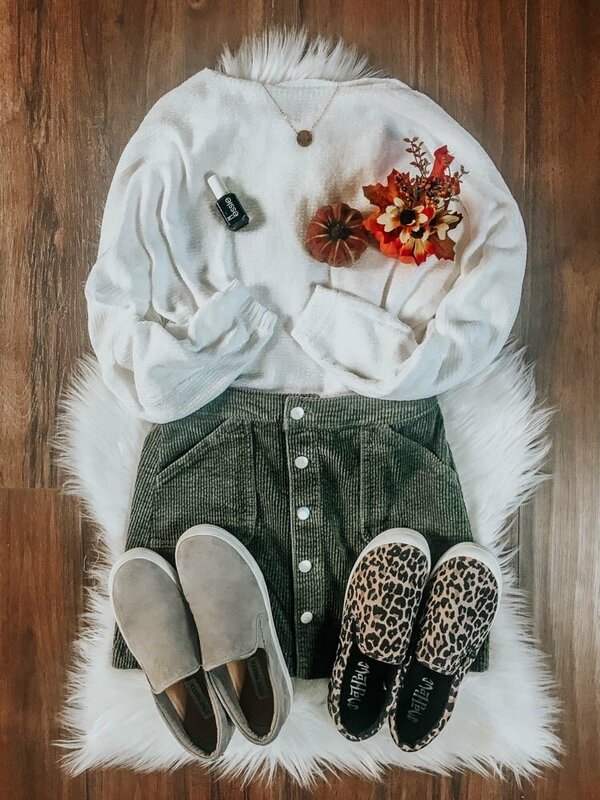 This entry was posted in Fashion and tagged cardigans, corduroy skirt, Fall fashion, Fall looks, Fall outfit ideas, Fall outfits, Fall skirt, Fall style, Fall sweater, Fall wardrobe, grey sneakers, leopard sneakers, olive skirt, outfit ideas, slip on sneakers, sweaters, Target favorites, Target style.